WOW! I really need to get disciplined about posting on here! I have had a hard time squeezing in fishing this season let alone posting about it. Anyway, here is a recap of my summer on the water. This edition will be dedicated to the Florida Keys. I got married on June 1. What an awesome day that was. But alas, no fishing on the wedding day! I had to wait until we were on our honeymoon in the Florida Keys. My wife, Tiffany, and I, spent the first two days in Miami Beach and then drove down to the Keys. We started the whole shindig with a trip to the IGFA Fishing Hall of Fame. It's a small place but very nicely done--my favorite part was simulated fish-catching where you actually fight a mechanical fish while holding a reel rod/reel in your hand. The fish peels line off the reel and then you have to reel as the line goes slack. We had an offshore charter planned to catch mahi mahi and tuna out of Miami Beach on day 2, but the captain's dog ate a poisonous frog and died that morning while he was cleaning the boat, so he cancelled. Fighting the elusive mechanical tarpon, at my secret indoor honeyhole. The Keys abound with beauty at every turn. What an amazing and indescribable place. I tried to capture some of it with my rod and reel, and Tiffany tried to absorb it with the camera. Still, we both put in plenty of hours behind the camera and with rod in hand. Our first stop was Robbie's Hungry Tarpon restaurant in Islamorada. 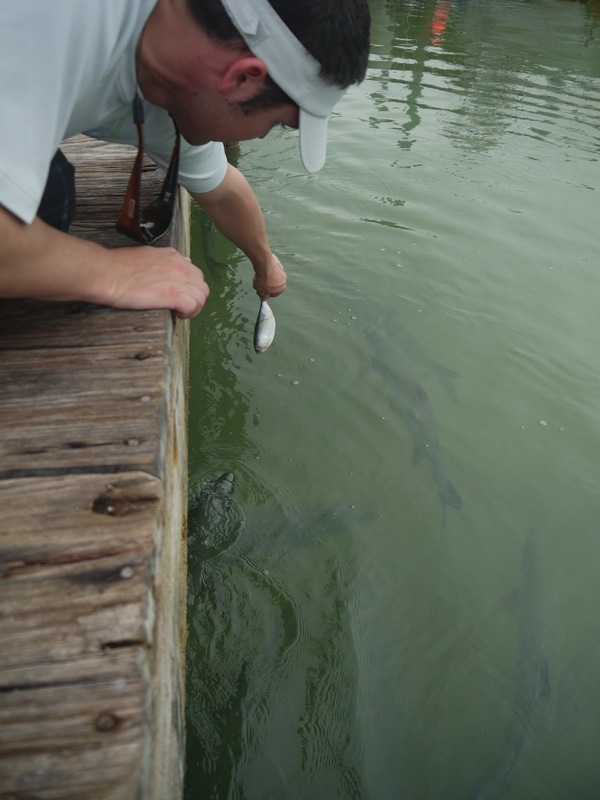 Here you can feed tarpon from 2-to-200 pounds right from the dock. Just watch out for aggressive pelicans. Or you can eat a delicious meal dockside and watch tarpon cruise by and eat out of other guests' hands. We did both. He is used to humans. You fear him. We fished everywhere from Islamorada down to Big Pine, although we spent time visiting each Key doing other activities. Without a boat but armed with our own spinning and fly gear, we targeted flats and bridges. We even had an expansive flat adjacent to our waterfront B&B in Marathon, so I spent some time wading there. Unfortunately, our week down there was unusually windy for summer in the Keys. Still, we managed to see a ton of fish and catch quite a few to make an interesting mixed bag. On the flats we saw tarpon, permit, bonefish, barracuda, small sharks and various stingrays. 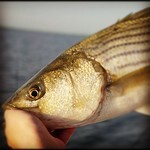 Of these, we caught none on the flats. But around the bridges and boat ramps, we managed to catch a number of jacks (Jack Crevalle), Mangrove Snapper, Snook, barracuda, and various Grunts. Some locals despise jacks, but I love them. They are very hard fighters and voracious eaters. One night around sunset I decided to cast a 5" pencil popper, and after a booming hit with cannonball-commensurate splash and few quick jumps, I lost a giant 4-foot-long barracuda to a bent saltwater-grade treble hook. I think they're pretty. Both of 'em. Capt. Rich Burson of R-U-Fishing-Yet charters showed us around the Everglades and the famed Islamorada bridges. Just our luck, this day happened to be the windiest day of the trip. Winds blew 20-30 kts all day, picking up through the afternoon. We started out in the Everglades grass flats fishing "muds." Muds are areas that appear silty or cloudy because hundreds (sometimes thousands) of fish are feeding on creatures in the grass, releasing sand and mud into the water. These muds can be acres in surface area. Where we fished, the muds were full of Ladyfish and Spotted Seatrout. People like to talk smack about Ladyfish (because they are more aggressive than the Redfish and Snook you are casting at and will steal the fly/bait away), but they fight hard and put on an aerial acrobatic show. We caught Ladyfish from 0.5lbs to huge 6+ lb'ers. We kept a bunch of these in the livewell to be used as live and cut bait for Tarpon later in the day. Tiffany stuck with the spinning rod, but I caught plenty of fish on the fly, including a nice 17" seatrout we ended up keeping for dinner (see the pic of prepared blackened fish). I caught a 20" trout on spinning gear that we released. Around the mangrove shorelines, we looked for snook, but found a ton of Mangrove Snappers. We kept a 12"er for dinner in addition to the seatrout. That was enough of a fish kill for us. I don't typically keep fish, but in the salt I will take a few to be prepared fresh. Robbie's in Islamorada did a heck of a job for us on the Seatrout and Snapper. 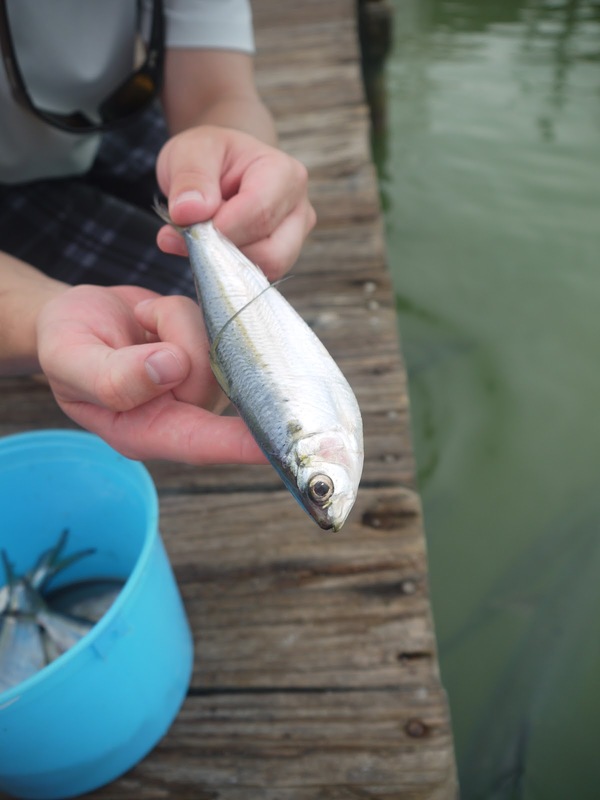 We made our way back to the Keys bridges to look for hungry Tarpon to eat our Ladyfish. After getting robbed of bait and hook twice by an enormous Barracuda, we motored to a different bridge, anchored, and dropped chunks of Ladyfish in the current behind the boat to lure the Tarpon near our live baits. To put it shortly, it worked! Tiffany hooked up with an estimated 140lb'er and fought it--her first ever Tarpon--for 50 minutes! It was a heck of a fight and I was amazed that despite all the pain and obvious agony, she never quit. She never tried to pass me the rod. This is just one reason I love my wife! 50 minutes and it's a caught fish! We also did a snorkel trip at Looe Key (an offshore coral reef) where we got an even more intimate look at giant Tarpon, Barracuda, sharks, Yellowtail Snapper, and other fish species. On the final day, we woke up very early to fish one last time on a great early morning tides. It was one of those times where first light and peak tide meet. So we begrudgingly woke up, zombied our way to the car with car, and drove 15 miles to the spot. And THAT'S when I realized I hadn't put the rods in the car. Sometimes you have to pause to watch the sunrise. The universe reminded me of that lesson that morning.